If you’re like most of the world, your current cell phone does not have wireless charging capabilities built into the device. Don’t despair, my friends. We can still make use of this magic method of battery charging without having to upgrade our current phone and without going to town with a soldering iron! Before moving on with the how-tos, I wanted to point out something about wireless charging you may not even be aware of. The charging stations come in various power specifications: that is, strengths. The lower-end specs – usually up to 5W – can charge your phone, tablet and even smart watches. The higher-end chargers – packing all the way up to a massive 120W – can handle laptops and computer monitors! Wireless charging is not limited to just your iPhone or Android these days – and can make your life a lot simpler! 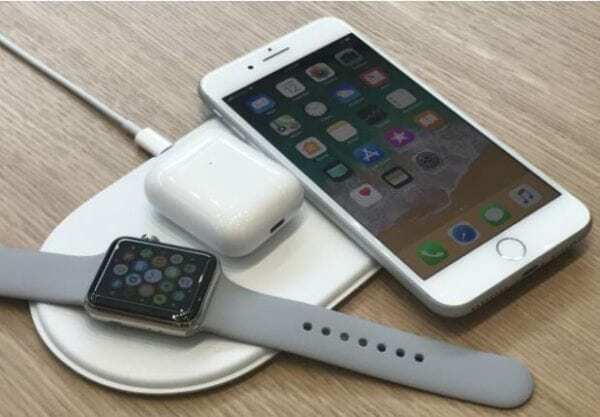 The big secret to charging your device wirelessly if it wasn’t built to do so is by buying a super-thin adapter that stays connected to your phone’s data port and power socket permanently. You can unplug it any time you want. However, if you’re going to do that, you might as well just keep using a standard cord to charge with. The adapter you’ll need is pretty standard – and fairly inexpensive these days… whether you use a MicroUSB type of phone or a Lightning connection. The coil part of the Qi charging adapter sticks right to the back of your phone. It is extremely thin – it will not stick out more than a single piece of computer paper and will still allow your case to fit perfectly. When shopping for your new charging device, you must be sure to find one that fits your phone’s charge port, looks good with your device plugged into it and it MUST have Qi compatibility or this entire experiment will be a waste. You can easily look for these at your favorite online store: Amazon included. While buying the device for your phone, tablet or wireless speaker, you’ll also need to purchase the charging pad that stays plugged in to a power source all the time. I highly recommend buying more than one of these, especially since they are quite inexpensive. If you are going to buy one and have to constantly take it from bedroom to kitchen to office, what is the point? You will still always be having to find the wire and plug things in. Another option is to buy a case that has wireless charging built into it. Using a case over top of a plugged-in Qi device can sometimes interfere with (or slow down) charging, so it honestly makes sense to consider these types of cases. Again, you can buy these in any number of places with a multitude of styles and colors to choose from. Once you have purchased a Qi-powered charging device and plugged it into your phone, you’ll simply lay it onto your wireless charging pad on your desk, table or nightstand. At this point, you may wonder if all of this shopping makes wireless charging worth it or not. Why would we want to do this instead of simply grabbing the end of a cord and plugging it into the phone? Honestly, it is a matter of preference. Once I got used to simply dropping my phone onto the pad at the end of a long day or when in a hurry prior to rushing to a meeting, I no longer had the desire to EVER have to search around for a cord that never failed to have fallen down between the cracks or gotten tangled up with a hundred other things on my desk (or nightstand.) The ease and speed of charging my phone using a wireless pad far outweighs the headaches I had on a daily basis when trying to extract cords while having little time or patience. Trust me: once you’ve tried this for yourself and used it for even just a few days, you will never again want to go back to having to rely on a cord. Plug the wireless charging receiver device you chose into your phone, tablet or wireless speaker’s microUSB port. Wrap the receiver module around to the back of your gadget and then fasten it down with a small piece of double-sided tape. Some of the wireless receiver packaging will include this tape. Put your phone or tablet (with the receiver connected) back into your case. Drop your beloved piece of tech onto the compatible Qi wireless charging pad and you’re golden! You can also carry over your wireless charging wonderland into your car! If your car is fairly new, check the owner’s manual. You may be surprised to find the vehicle already has this functionality built into it. If not, it is a simple matter to get you where you want to be. Qi-compatible charge pads for your car is a bit more expensive than the ones you are buying for your house or office due to the fact that they have to have extra hardware for their GPS-style display. Most of the options you’ll find, though, are under about fifty bucks. Many of these only require a standard cigarette lighter adapter/port to function perfectly. Have you tried – or thought about – wireless charging yet? What are your thoughts? Is this something you think you won’t be able to live without? Do you have questions for us regarding different types of chargers out there or how to make the most of what you will be buying? Drop us a comment and let us know. We will do everything we can to help, as always.